Issues in Finance: Credit, Crises and Policies presents a collection of surveys on key issues surrounding the relationship between credit, finance, and the macro-economy that are linked to the recent global financial crisis. Stuart Sayer is Professor of Economics Education, University of Edinburgh, Executive Director of the Scottish Institute for Research in Economics (SIRE), and Editor of the Journal of Economic Surveys. His research is in macroeconomic and monetary theory and policy, political economy, economic policy-making, and climate change economics. 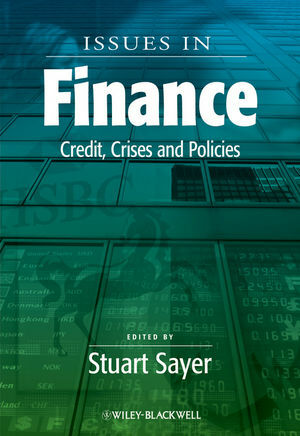 Issues in Finance: Credit, Crises and Policies – An Overview (Stuart Sayer). 1 Bank Capital Requirements, Business Cycle Fluctuations and the Basel Accords: A Synthesis (Ines Drumond). 2 The Ten Commandments for Optimizing Value-at-Risk and Daily Capital Charges (Michael McAleer). 3 The Ten Commandments for Managing Value at Risk Under the Basel II Accord (Juan-Ángel Jiménez-Martín, Michael McAleer and Teodosio Peréz-Amaral). 4 Sovereign Insolvency Procedures A Comparative Look at Selected Proposals (Kathrin Berensmann and Angélique Herzberg). 5 Collective Action Clauses in International Sovereign Bond Contracts – Whence the Opposition? (Sonke Haseler). 6 Collateral and Credit Rationing: A Review of Recent Empirical Studies as a Guide for Future Research (Tensie Steijvers and Wim Voordeckers). 7 The Stock Market, Housing and Consumer Spending: A Survey of the Evidence on Wealth Effects (Monica Paiella). 8 Price-Level Targeting and Stabilisation Policy: A Survey (Steve Ambler).